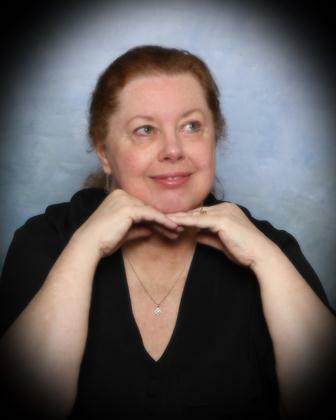 Please welcome poet Nona Kelley Carver, who shares her poetry about Christmas for our soldiers serving away from family. in his heart feels sad tonight. but none of them are in sight. that this is Christmas Eve. from a loving mom and dad. and told him how angels sang. And it seems so very long ago, when no echo of bullets rang. He remembered the crèche that they set in place there under the Christmas tree. And how the sweet baby Jesus was a gift of love that lasts through eternity. That sometime soon this war will end and the shelling and killing cease. So those at home in the USA will be safe and have restful sleep. the land of the red, white and blue. and he felt less sense of loss. "God Bless America." May her freedom ever ring! I love living in the Sierra Mountains where the 1849 Gold Rush brought a lot of people to our area. Part of the pleasure of living here are the museums, traditions and old timers that still have memories – and they love to share them with anyone who is clever enough to listen. History is my favorite genre because there are so many interesting tales. 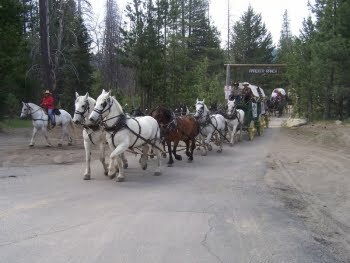 One of the traditions is to bring a wagon train over the high pass between Lake Tahoe and Placerville every year. The historical reenactment of the “Great Western Migration,” a designated bi-state event that takes place in California and Nevada, happens every June. 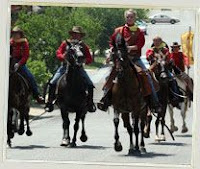 All wagons are authentic vintage replicas and period clothing is worn at all times by wagon train participants. 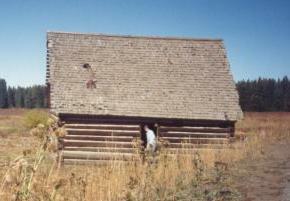 School groups often travel with them for one or two days, doing all the things a child might have done 150 years ago when he or she traveled west with their parents. It takes about a week and the people who relive this experience make it as close to the actual event that it seems real. 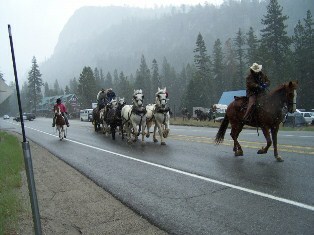 The highway patrol closes the road and the horses plod along with their loads. They spend a night in the parking lot of the bowling alley down the road from us and the last day, they ride in a parade through town before throwing a huge barbeque. We are also on the route of the pony express rider. One year my daughter and I were at the post office and when we came out, there he was – a reenactment pony express rider, carrying mail back over the high pass toward Lake Tahoe. We followed behind him all the way to our turnoff. Can you imagine how long it took a letter to travel from here to ‘there’, wherever ‘there’ was? 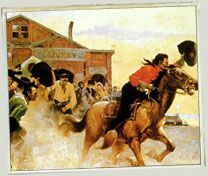 The story of the Pony Express has continued to fascinate Americans since Johnny Fry left St. Joseph April 3, 1860, heading west to Sacramento, CA. This relay mail service celebrated 150 years on April 3, 2010. The Central Overland and California Pikes Peak Express Company carried letters and telegrams for 19 months proving the train and pony with riders could make the trip over 1,966 miles in 10-14 days. It's the time of year when families and friends gather to share food, gifts and memories. 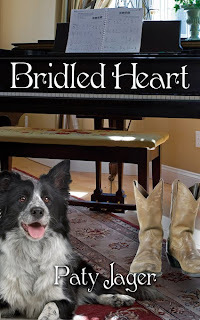 My January contemporary western release, Bridled Heart, which was released early this week in print from my publisher Wild Rose Press is about Gina Montgomery. 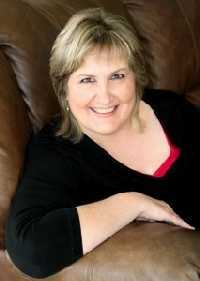 She's a woman who had the strength to heal herself after a childhood of sexual abuse and learned to help others heal. She encounters the one man who will test the order and rules she's made to keep herself from falling apart. 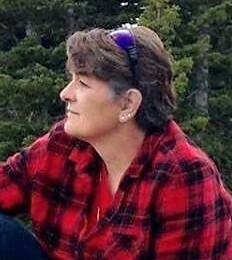 One of the characteristics I give Gina in the book is a strong memory of her mother. The one person who's love, even after her death, she clung to for strength. And the memory that surfaces in the book is the scent of baking cinnamon rolls and the comfort and love she feels when she eats one. 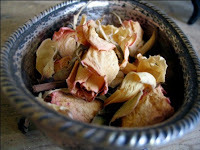 Do you have any memories that certain foods conjure up? 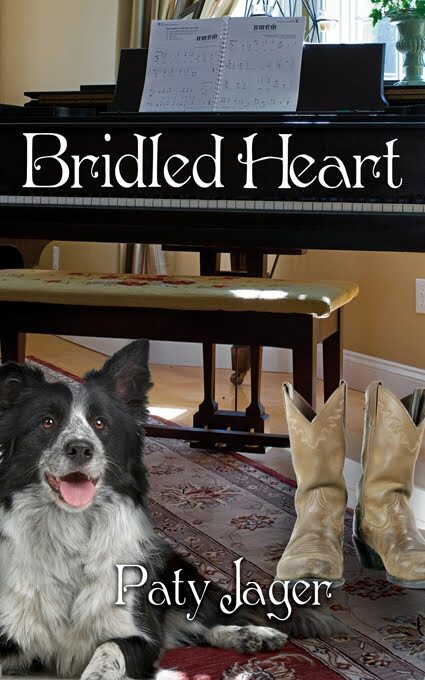 Here is the blurb and excerpt from Bridled Heart and at the end is my recipe for Cinnamon Rolls. “Why do you help with this event?” He laced his fingers together resting his hands on the table in front of him. His coffee-colored gaze held admiration. She dropped her gaze and picked at her napkin. His interest was flattering, and he hadn’t attended the event just to inflate his image. If that had been his agenda, he would have stayed to be photographed with the person who purchased his art. She peered into his smiling face. He waited so patiently for her to answer. By this time most men would have given up on her and moved on to someone else. She searched his eyes. He seemed genuinely interested. She took a deep breath and hoped she wasn’t going to regret divulging more. “I see so many children in the ER rooms who…” she turned her head and chewed on her cuticle. When they arrived needing her care, she put aside her emotions and did the job, but afterward, she always broke down. How could a parent do that to a child? She knew how it felt to grow up feeling different. She stared into his eyes. The sincerity of his words and the acceptance of her pain, even though he thought it was all for others made her want to weep. She hadn’t had anyone care about her in so long, she didn’t know how to act. He held her firm but gentle. Warmth spiraled up her arm and settled in her chest. Why didn’t she feel frightened or invaded by this man? She shook her head. She didn’t want to see him again. If she did, it would be hard to remain faithful to her vow. He’d started to seep into the empty cracks created over the years. In a large bowl thoroughly mix 1 1/2 cups flour, sugar, salt, and undissolved yeast. Combine milk, water, and margarine in a saucepan. Heat over low heat until liquids are very warm. (I use the microwave) Margarine doesn't need to melt. Gradually add to dry ingredients and beat 2 minutes at medium speed of electric mixer, scraping bowl occasionally. Add 1/2 cup flour. Beat at high speed 2 minutes, scraping bowl occasionally. Stir in enough additional flour to make a soft dough. Turn out onto lightly floured board; knead until smooth and elastic. Place in greased bowl, turning to grease top. Cover; place bowl in pan of water at about 98 degrees F. Let rise 15 minutes. Turn dough out onto floured board. Roll out 12" by 20". Spread with soft margarine sprinkle liberally with brown sugar and cinnamon. Roll up the long side like a jelly roll and cut into 18 pieces. Place cut side down in a pan that has melted margarine and sprinkled with brown sugar. Let rise 15 minutes in draft free warm place. Bake at 375 degrees for 25-30 minutes. Frost with powder sugar or butter cream frosting. 18 servings. I was so excited to find this poem! It's something I enjoyed listening to on my mom's old Jimmy Dean Christmas album. I can still hear the scratchy sound of that record as I read the poem even now. 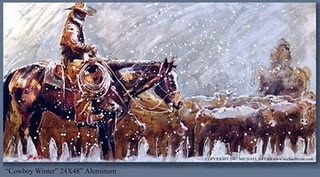 As you may have begun to notice (*VBG*) I love all things cowboy and this is the perfect Christmas wish! I hope you enjoy it! There ain't no Merry Christmas for a man if he ain't free. To save some seeds of freedom for the future sons of man.! Okay, here’s a pet peeve of mine….those who don’t know when the twelve days of Christmas are. These days I’m seeing all sorts of references to the Twelve Days of Christmas. Between now and Christmas: get free books, recipes, or enter a contest. The only problem is that NOW is not the Twelve Days of Christmas. They are not the twelve days BEFORE Christmas. They are the twelve days AFTER Christmas. This mixed up reference, is to me, as maddening as those who object to Christmas decorations before Halloween. We are putting one celebration before another. Part of this confusion comes from people who are not part of a liturgical church tradition. This is not a bad thing, it’s just a misunderstanding of when and what the Twelve Days are all about. The churches that follow a liturgical year (Advent, Christmas, Epiphany, Lent, Easter, Pentecost) have set the time-line for the celebration of the Twelve Days of Christmas….the Christmas season, which is from December 25th through January 5th, the day before the Epiphany or the traditional day of celebration for the visit of the Three Kings to the baby Jesus. In some cultures, Christmas is celebrated as a holy day, without the exchange of gifts. Gifts are instead exchanged on Epiphany or, in some cases, a gift a day is exchanged during the Twelve Days of Christmas. Epiphany, January 6th, as said, is the observation of the day the Magi arrived to pay homage to the Christ child. They brought their gifts for the new-born king. In the liturgical year, it is the beginning of the Epiphany season, the time before Lent starts with its forty days of self-deprivation. No doubt, you’ve heard of Mardi Gras and the big parties held around the world in observance of it. A traditional time of celebration and revelry. One goodie often found at this time is a king cake, a reference to the three kings. This time of celebration is held during Epiphany Season, and ends on the Tuesday before Ash Wednesday. Ah, but I digress, though I did want to show how the year follows one thing after another. It helps to explain when the correct Twelve Days of Christmas are. The Liturgical Year starts with the First Sunday of Advent, four Sundays before Christmas Day. For 2010, that ‘new year’s day’ was November 28th. From then until Christmas Day, the liturgical church is in the season of Advent. The season of Christmas starts with Christmas Day and goes for twelve days. January 5th is often referred to as Twelfth Night. In some traditions, it marks the removal of Christmas decorations and feasting. I’m also sure you’ve heard of the song The Twelve Days of Christmas. The origin of this song is in dispute, but the meaning behind it doesn’t seem to be. The items given to the ‘singer’ of the song are not as simple as they appear. The do, in fact, refer to God’s grace. The “true love” giving the gifts represented the pure love of God. Each gift represented a major doctrine of the Catholic faith. The partridge represents the courage and devotion of Christ dying for his people. A mother partridge will lure predators away from her chicks, even sacrificing her life for them. The pear tree symbolizes the wooden cross upon which Jesus died. This represents the Old and New Testaments of the Bible. Doves also symbolize truth and peace. French hens were the food of kings in sixteenth century England. Here they represent the expensive gifts brought by the wise men to the newborn Jesus. These symbolize the authors of the four Gospels. These are the five Old Testament books known as the Law of Moses. Here we have the six days in which God created the world. The eggs, from which new life springs, symbolize creation. These represent the seven gifts of the Holy Spirit outlined by the apostle Paul: prophesy, service, teaching, encouraging, giving, leadership and mercy. The swan, a graceful bird, symbolized these virtues. Being a milk maid was one of the lowest jobs in sixteenth century England. Jesus came to save the poor and the humble, thus this gift represents Jesus’ love for the common people. This dance represents the nine fruits of the spirit: love joy, peace, patience, kindness, goodness, faithfulness, gentleness and self-control. Here is a reminder of the Ten Commandments. These represent the eleven faithful apostles who followed Jesus to the end and spread his message after his death. While there were twelve apostles, one betrayed Jesus. This is a symbol for the twelve tenets of the Catholic faith laid out in the prayer, “The Apostles’ Creed”. The drummers may provide the cadence for reciting this prayer. Thinking you might want to give these gifts? Remember first off that the items repeat themselves. So that on the second day, it’s a gift of two turtle doves AND a partridge in a pear tree. On the third day it’s three French hens, two turtle doves and another partridge in a pear tree. So that at the end of the 12 days, you’d have given 364 gifts, which in 2010 would cost $96,824, an increase of 10.8% over last year, according to the annual Christmas price index compiled by PNC Wealth Management. And remember, you start giving them on Christmas Day...not December 13 or 14th. The holidays are upon us. And I want to take this opportunity to wish everyone a Merry Christmas and Happy Holiday. May the spirit of the season stay with you through the coming year. And may 2011 bring you many good books to read. 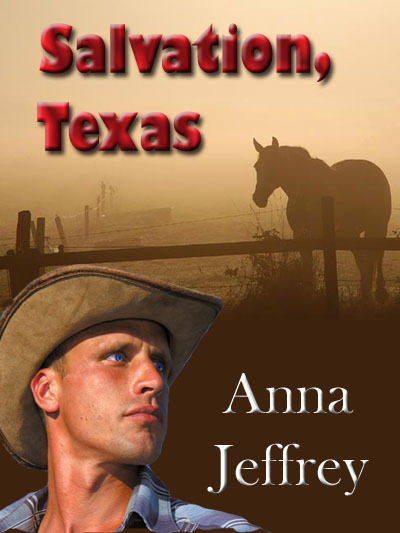 I’m also taking this opportunity to shamelessly hype my latest self-published digital book, SALVATION, TEXAS. It’s a contemporary romance/mystery/police procedural set in West Texas, and is a re-issue of the print book, which was released in 2007. It’s uploaded to Kindle and is now available for sale for $2.99. It’s also now uploaded to Smashwords, so it should be available soon at Barnes & Noble (Nook), Kobo, Sony (Sony Reader), Diesel and Apple (iPad) for the same price. When a deputy’s job opened up in the Sanderson County sheriff’s office, career cop Rusty Joplin left the city and returned to his Texas hometown of Salvation. The last thing he expected to encounter in his new job was a nest of deceit and fraud and a sheriff controlled by a master manipulator, the wealthy rancher/oilman, Randall Ryder. But Ryder’s influence peddling was no surprise to Rusty. He had already had a taste of the millionaire’s deviousness fifteen years back when he had been forced out of town over his heated relationship with Ryder’s youngest daughter, Elena. The beautiful Elena Ryder still haunts Rusty. He might never know what to do about her presence in his dreams, but he knew how to deal with the corruption in the sheriff’s office. He ran for the office himself, won by a landslide and began to change the way the Sanderson County sheriff’s office operated. Then, mere months after he takes office, Elena’s older sister, Randall Ryder’s middle daughter, is found dead in her arena, strangled in what looks like a runaway horse accident. 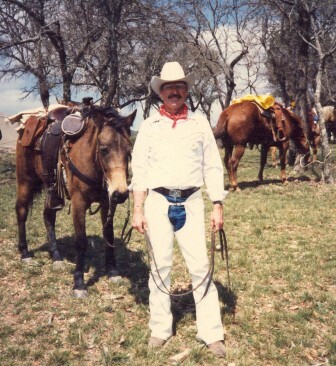 But Rusty’s years of experience with both horses and murder investigations, lead him to believe something more sinister. His relentless probe into Carla Ryder’s death not only reveals Salvation’s secrets, but throws him back into Elena’s arms. He had neither expected nor wanted a second go-round with her, but he’s helpless to resist. 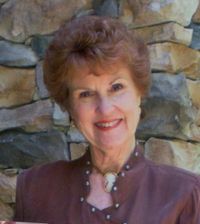 Elena Ryder has longed for fifteen years for Rusty’s return, during which she has earned a nursing degree from the college of her father’s choice, lived at home with him and now works at the Salvation hospital as an RN. She has refused to marry any of the men her father chose to be her husband. 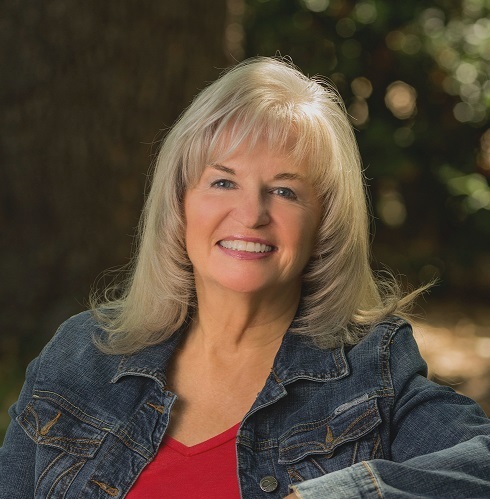 She has never stopped believing that she and Rusty Joplin are destined to spend their lives together. ... Her sister’s tragic end brings her into contact with Rusty again and only reminds her how much she still loves him. When he labels Carla's death as murder, bringing into question the custody of Carla's three small children, Elena has unwavering trust that Rusty will find the culprit, no matter who he or she is. So that’s a thumbprint of the story. If a Kindle is in your Christmas stocking, or a Nook or some other reading device, perhaps you would like to read SALVATION, TEXAS or my other digital book, SWEET WATER. Free samples are available from both Amazon and Smashwords. Several decades ago, flocked Christmas trees were all the rage. In the Old West, people went for the real thing. You can probably tell from this picture that they're my family's favorite, too. 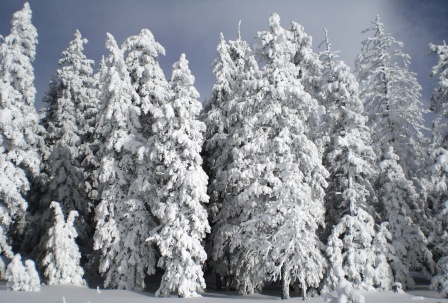 We treasure times spent together finding and harvesting each year's perfect Engleman Spruce. For us, as it is for most, Christmas is about home and family. Yet, those were scarce in the Old West, leaving the holiday to start in slow and meager fashion despite fancy traditions already set back East. 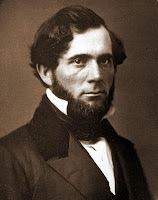 Government funded explorations weren’t the only white men in the Rocky Mountains during the 1840’s. 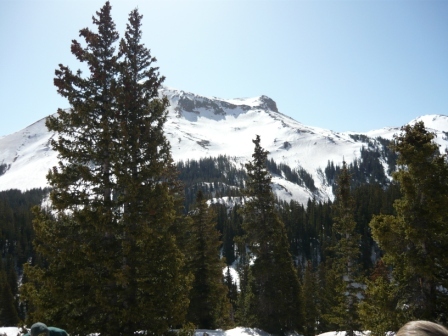 Mountain men discovered passes and fertile valleys the government parties missed. 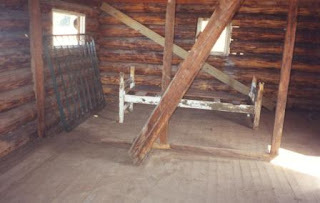 The fur trade spread through the Rockies. 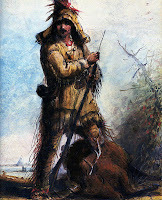 Trappers mixed with Indians. Where and when possible, the white men introduced their joy of great feasts on December 25, which the Indians dubbed “The Big Eating.” For one such Christmas celebration, James Kipp, a grizzled mountain man, planned to treat his fur traders and Indian allies to a big surprise at Fort Union, Montana. Weeks before the holiday, Kipp fattened a large heifer, a rare commodity then, for his gift of an “Eastern” delicacy. However, he received the day’s biggest surprise. A few bites of beef convinced all the other diners the “tame” meat was “too fat and downright sickening.” They returned to the lean buffalo and other wild meats which present day society has recently embraced for its health benefits. Buffalo, or bison as it’s labeled in the stores, is easy to find in western states. Elk, venison (deer), quail, pheasant, not so easy, but certainly available with a little research. Life in the Old West, considered romantic now, was labor intensive with few celebratory breaks. It was natural to pause at Christmas and reflect on joys or hardships of the time, on memories of the past, and on dreams of the future. Such reflections hit harder, deeper in the back of beyond, where nothing was familiar and survival itself was difficult. Although more people ventured west as years passed, conditions remained challenging. ski in to take a pic in dead of winter. One Christmas I spent up on the mountainside with two or three others. There we had our holiday dinner. It was a wholesome meal, but wanted in those delicacies that a mother or a wife can best prepare. “I wish we had some flowers for the Christmas table,” said one of the boys. We all wished the same. “Get out your old letters,” said one. We all knew what he meant; for many a flower from the old home finds its way in a letter to the boys out West. One found a rose-bud, another a violet, another a daisy, and then another rose was found in a mother’s letter. Withered and faded were those tokens from the old homes, but never did the men value flowers more than we did with that withered bouquet. “Can’t someone say grace?” said one of the boys. “Read them,” was the response that came from all. Heads were bowed around the frugal Christmas board and the young man read. I then looked up and saw tears on the cheeks of the weather beaten faces. This tale of a homesick Christmas was published in Western Yesterdays. You see, this was the twenty-fourth of December. Tomorrow was Christmas. The first thing was a fire. The wood we’d crammed into the old box stoves at opposite corners of the cabin had burned out. The place seemed colder than it was outside. So we began shaving kindling with hands so numb we could hardly hold a knife. Now if only I were up in Billings with [my old partner] Hank, a mug of steamin’ Tom and Jerry in my hand. The thought of that was so warm and pleasant that I didn’t notice that my new partner had lighted the kerosene lamp. There in the middle of the floor was a big wooden box. The camp tender, who had made a hurried trip in there that day with the grub and supplies, had left it. There was a tag on it, addressed to us! “Who’s it from, Jack?” he asked. I read the names. From our bosses, in Boston. I never expected anything from them. Why, we hadn’t been working for them more’n three weeks. To think they’d remember us. We pried off that lid in a hurry, began pullin’ out things. We was as happy as any two little boys you ever saw. Two Arctic sleepin’ bags. We wouldn’t be cold any more at night. Thick wool socks, tobacco, a big fruit cake, candy. Best of all, there was several good books. I used my old set of Encyclopedia Britannica for this post along with two books: Christmas in the Old West by Sam Travers and A Rocky Mountain Christmas by John H Monnett. They were located for me by Jennifer Murrell of my local library. 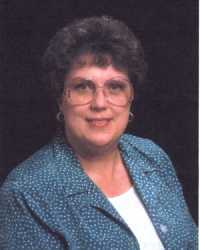 I want to thank her for her excellent research and dedication in tracking down these books. Each was provided by an outlying library. Libraries are invaluable resources for writers; we owe a great deal to the employees, volunteers, and members. Jennifer, You Rock! 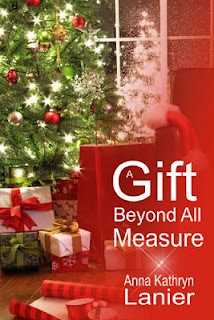 A CHRISTMAS COLLECTION--STORIES FOR CHRISTMAS!